The CH 750 Cruzer kit includes many great features and is much easier and quicker to build. The kit includes many CNC pre-cut and pre-drilled skins and components, and also includes CAD Drawings and Photo Assembly Manuals. The modern CH 750 Cruzer kit has been developed to provide the builder with everything needed to complete the airframe – with only basic tools and skills. The CH 750 Cruzer airframe requires less than 400 hours to build from the complete factory-supplied kit. The CH 750 Cruzer is one of the few kits on the market that doesn’t just come with assembly instructions. The kit includes detailed blueprints of every part of the airframe, as well as a detailed assembly manual. In fact, the CH 750 Cruzer can be ‘scratch-built’ from the Drawings and Manuals, although this requires additional skills, time and tools. Supplied with the complete CH 750 Cruzer kit, the drawings are not just assembly instructions (as with most kits), but are detailed 11″ x 17″ CAD blueprints of the entire airframe assembly and individual parts, and come with an assembly manual. 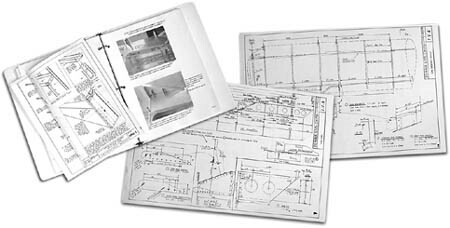 The CH 750 Cruzer Drawings & Manuals package includes a CD-ROM with high-resolution Photo Assembly Guides for the step-by-step assembly of the CH 750 Cruzer kit. Supplied with a serial number, you can actually build your own aircraft from “scratch” following the Drawings and Manuals. Scratch-builders can purchase any individual parts or components directly from Zenith Aircraft Company. If purchased separately, the cost of the drawings and manuals is deductible off the cost of the full kit. Following are some selected sample CAD drawings from the STOL CH 701 drawings. These are sample drawings only and are for informational and educational purposes only.